OUR PHONE NUMBER IS 712-239-2106. MOST PHONE CALLS ARE RETURNED DURING THE EVENINGS. Do you sell Gothic Rings? Yes I do. I AM THE ONLY INTERNET AUTHORIZED DEALER FOR GOTHIC JEWELRY. I have a longstanding relationship with Gothic and am the only internet site authorized to sell their products. 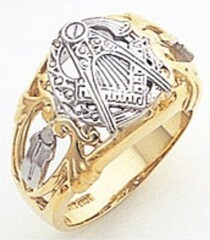 Not all rings on my site however are Gothic; I choose to deal with only 4 manufacturers of fraternal rings. I believe that my 4 choices of suppliers are the best in the business. I have seen a lot of the work being sold by my competitors and I have chosen not to sell some of the same products offered by them. Do you sell rings made by Wefferling-Berry? I am the only authorized internet dealer of Wefferling-Berry rings. In addition to the Gothic Rings; in my opinion, they are some of the finest fraternal made rings available in the market today. Do you do repairs? I repair rings for my customers. Normally I only repair rings that have been purchased from me. On some occasions I repair rings other than those purchased from me when asked by existing customers. Do you take payments? We do. We can make almost any kind of payment arrangement. Product will be shipped upon final receipt of payment. Are you a Mason? Yes I am. I a member of North Riverside Lodge # 662 located in Sioux City, Iowa. I am also a York Rite and Scottish Rite Mason. I am a member of the Abu Beker Shrine Temple located in Sioux City and Past Captain of the Rat Patrol. I am a member of the Royal Order of Jesters Court 124. Your ring sizes only go up to a size 13. Can you make a larger ring? Yes I can. I can make any size ring that you want. I have actually made rings up to a size 16. When placing your order, just let me know in the comments section. What is the difference between an open back ring, a solid back ring and a closed back ring? In an open back ring the area behind the head of the ring is open; in otherwords the back of the ring is not entirely filled in with gold and in a stone ring you could see the back of the stone. In a solid back ring, the entire back of the head of the ring is filled in with gold making the entire inside surface of the ring smooth like a wedding band. A closed back ring appears to be the same as a solid back ring except the back is not completely filled in with gold. It appears smooth like the inside of a wedding back but there is a void behind the head of the rings (not seen) so that it is not completely filled with gold. A solid back ring is my personal preference because I like the weight it gives to the ring in addition to making it more durable. Some of your ring descriptions refer to the "width" of the ring. What do you mean by that? The ring width is measured as the distance between the knuckle and the first joint of the ring finger. Sometimes it is easier to think of the width of a man's basic wedding band, normally about a 1/4 inch or so. I purchased a ring from Fox Jewelry and it needs to be resized. Can I have it done locally? The choice as to where to have a resizing done is entirely yours. I do suggest that you return it to Fox Jewelry to have it done. Some jewelers do not protect the enameling process when resizing and damage can be done to the ring. I will charge a minimal charge to have this done to cover shipping, handling and the cost of the gold to do the resizing. Do you engrave? Yes we do. Cost of engraving is $2.50 per letter or character. Indicate what you would like engraved in the comment section when you place your order. The minimum engraving charge is $35.00. 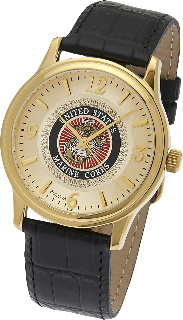 Please note that engraving can add 3-5 additional business days to your order. Minimum charges on Gothic rings are $35.00 for up to 13 letters. Do you ship to APO addresses? We certainly do. Shipments to APO addresses generally ship via the USPS. Do you ship international? We do sell internationally, We are very skeptical of international shipments. 99.9% of fraudulent purchases are made from destinations outside of the United States. Shipping charges will normally be about $70.00- $100.00. There is also a minimum order on international shipments of $150.00 plus shipping & handling. Any additional charges for import taxes, duties, sales taxes, value added taxes etc are for the account of the purchaser. Do you have any trouble with people using stolen credit cards? I have had some problems in the past with people using other people's credit cards to make purchases. Please safeguard your credit card information. Safeguard your receipts and tare up the carbon copies whenever possible. I will prosecute to the fullest extent of the law anyone attempting to use or utilizing someone else's credit card without the cardholder's permission. CUSTOMERS. ALL CREDIT CARD INFORMATION GIVEN TO ME ON MY ORDER FORM IS ENCRYPTED SO THAT NO ONE ELSE CAN READ IT. THIS IS A SECURE WEBSITE. Can I return my merchandise if I don't like it. In addition to the answer provided below, please see my return policy. You can if the item if it has not been altered or custom made for you. Upgrades to jewelry such as for 10 karat to 14 karat, open back to solid back, addition of diamonds, side emblems or engraving, etc are considered custom rings. Special requests by customers to custom build rings are not returnable for refunds. The return request from you must be in the form of an email and must be made within 10 days of delivery. Please ensure that you order the proper size in the first place. This will save us all a lot of time and unnecessary expense. Wives and girlfriends, I have more returns from you than the men making purchases. When purchasing for the man in your life, my experience in this business has been that it is good to have the recipient of your gift see what you are purchasing for them whenever possible. 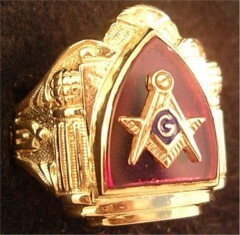 Jewelry items are very personal, especially the fraternal rings. A lot of these items become heirlooms to future generations. Let's make sure that the man in your life has some input on this. Order the correct size. Keeping my returns to a minimum is essential for me to be able to keep my prices as low as possible. Your prices are very reasonable. How do you keep them so low? This is a purely an Internet business and I carry no inventory which means that I can keep my expenses far below any retail store. These savings are then past on to you. All of my merchandise is of extremely high quality. You will find any of it in the best jewelry stores in the country. When you give a price quote, how long is it good for? Because of the highly fluctuating gold market, my price quotes are good for 7 days unless otherwise agreed upon. Do you have access to merchandise not shown on your site? I have access to almost anything that you may want. Just send me a note and let me know what you are looking for. When is my credit card charged? Your credit card is charged shortly after you order your merchandise and certainly prior to shipment. There is a minimum charge of $25.00 once a credit card has been charged in the event an order is cancelled. There could be additional charges if the order has gone into production. Do you have a catalog? I do not have a catalog. I am constantly adding items to my website as well as running specials, changing prices etc. A catalog is too restraining and costly. Not having a catalog helps me keep my prices down. 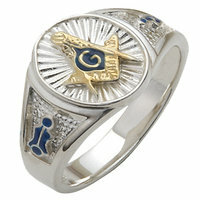 Are your fraternal rings available in silver or stainless. 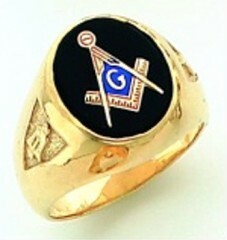 I do carry a limited selection of fraternal rings made of stainless steel. 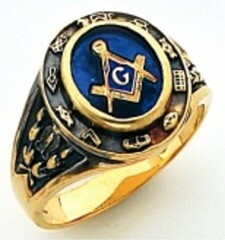 All of my fraternal rings are 10KT or 14KT gold or some are available in sterling silver. Many are available in White Gold and even Platinum. Platinum runs approximately 3 to 4 times the 14KT gold price. What credit cards do you accept? Visa, Mastercard, Discover, American Express. I also take PayPal. How do you apply the percentage increases to your items? All increases are applied to the base price of the item and then totaled. You will receive a corrected invoice after I have reviewed the invoice and added for the respective upgrades such as solid back 14kt gold, etc. How can I determine my ring size? First of all, the best way to determine your ring size is to have a jeweler do it for you. There are other options; trace the inside of a ring that fits and fax the tracing to me at my fax number which is 801-720-8666. Upon its receipt, I will email back to you the size. Make sure that you supply me with your email address. 1. Cut out an eighth inch to quarter inch strip of paper. 2. Wrap it around the base of your finger. 4. Measure the length from the starting end to the pen mark. Please remember that all returns will require a return authorization number and need to be sent insured for the value of your return. Buyer specifically agrees that US Postal Service (USPS) Delivery Confirmation and/or Signature Confirmation or United Parcel Service (UPS) confirmation of delivery constitutes irrefutable proof of delivery. In the event that buyer requests that their purchase be delivered to an address other than the billing address of record for the credit card used for the corresponding transaction, buyer agrees to assume all risk and agrees that USPS Delivery Confirmation and/or Signature Confirmation with or without purchasers signature or UPS proof of delivery with or without purchasers signature, shall constitute irrefutable proof of delivery. If I have to return an item, where do I send it to? Contact Foxs Jewelry for instructions on returning an item. Please ensure that you receive a return authorization number and include it with your name and address provided in the return package. I have a Leslie's necklace that I purchased from a vendor that is no longer in business. Can I return it through Fox Jewelry You certainly can! If the item is repaired or replaced with an identical item, Fox Jewelry will handle the transaction for a fee of $50.00 to cover handling and shipping of the item. In the event a credit is issued, the credit must be spent on an item of equal or greater value. What is Moissanite? Unlike any other jewel ever seen! Properly cut by master cutters the comparison to fine diamond is unavoidable, moissanite has measurably more fire, brilliance and luster at a fraction of the cost of diamond. These faceted jewels now offer you a variety of choices as they are available near colorless to very slightly tinted are available in round, oval, marquise, pear shape, radiant cut octagon, heart shape, triangle, trillion, princess cut squares, and antique squares. "The optical properties, provide diamond with it's brillance, luster and fire. Moissanite out performs diamond on all counts." As quoted from world renown expert Allan Hodgkinson, F.G.A. D.G.A and author of the Rapport Diamond Report Article on Moissanite dated December 4, 1998, The following properties chart will show the facts. Editors Note: Information for this article was provided by Charles & Colvard . Is Moissanite synthetic diamond? No. A lab-created jewel is cut to take advantage of the exceptional properties most of us like to see in fine jewelry. How is moissanite made? Single-crystal moissanite is manufactured through a patented thermal growing process, the specifics of which are proprietary. The process is very difficult and is performed by only one company in the world. How is moissanite graded on the GIA diamond color grading scale? Moissanite is not graded on the GIA color scale. It is available in a near-colorless form that is brilliant and highly dispersive - thus, a beautiful jewel. How is moissanite graded for clarity? Each individual jewel is examined using a 10x loupe for inclusions or damage that may affect the optical performance of the jewel. How hard is moissanite? Charles & Colvard created moissanite is measured at 9.25 on the Mohs scale-harder than all other materials used as gemstones, except diamond. Why is the price of Moissanaite so much higher than CZ? There is no comparison; moissanite is a much higher quality product. Why is the price of Moissanite so much higher than CZ? There is no comparison; moissanite is a much higher quality product. What materials can scratch Moissanite? Carborundum abrasives and any harder materials can scratch moissanite. Why is Moissanite cut to the proportions and dimensions it is? The unique cut of Charles & Colvard moissanite is specifically designed to maximize the performance derived from the superior optical properties of moissanite: fire, brilliance, luster. What is Blue Spinel? Spinel is a very attractive and historically important gemstone mineral. Its typical red color or blue color, although pinker, rivals the color of ruby. In fact, many rubies, of notable fame belonging to crown jewel collections, were found to actually be spinels. Perhaps the greatest mistake is the Black Prince's Ruby set in the British Imperial State Crown. Whether these mistakes were accidents or clever substitutions of precious rubies for the less valuable spinels by risk taking jewelers, history is unclear. The misidentification is meaningless in terms of the value of these gems for even spinel carries a considerable amount of worth and these stones are priceless based on their history, let alone their carat weight and pedigree. Today, expensive rubies are still substituted for by spinel in much the same way a diamond is substituted by cubic zirconia. Not to commit a fraud or theft but to prevent one. Spinel may take the place of a ruby that would have been displayed in public by an owner who is insecure about the rubies safety. The spinel probably is still valuable but better to lose a $100,000 dollar spinel than a $1 million dollar ruby! Spinel and ruby are chemically similar. Spinel is magnesium aluminum oxide and ruby is aluminum oxide. This is probably why the two are similar in a few properties. Not suprisingly, the red coloring agent in both gems is the same element, chromium. Spinel and Ruby also have similar luster (refractive index), density and hardness. Although ruby is considerably harder (9) than spinel, spinel's hardness (7.5 - 8) still makes it one of the hardest minerals in nature. Do you sell Gothic Rings? Yes I do. I AM THE ONLY INTERNET AUTHORIZED DEALER FOR GOTHIC JEWELRY. I have a longstanding relationship with Gothic and am the only internet site authorized to sell their products. Do you do trade-ins? I am sorry but I do not deal in used jewelry. I only deal in new merchandise. Do you do engraving? We can engrave on most items. Charges run $2.50 per character subject to a $35.00 minimum. Engraving can also add 1 to 2 weeks to the delivery time. What is the difference between an open back ring, a solid back ring and a closed back ring? 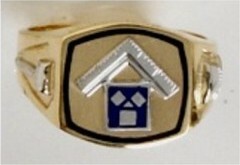 What is the quality of the diamonds in your fraternal rings? In an open back ring the area behind the head of the ring is open; in otherwords the back of the ring is not entirely filled in with gold and in a stone ring you could see the back of the stone. In a solid back ring, the entire back of the head of the ring is filled in with gold making the entire inside surface of the ring smooth like a wedding band. A closed back ring appears to be the same as a solid back ring except the back is not completely filled in with gold. It appears smooth like the inside of a wedding back but there is a void behind the head of the rings so that it is not completely filled with gold. Prices quoted are for SI1 quality, G-H color stones. This is pretty typical of the quality of diamonds sold with most fraternal rings. Higher quality diamonds can be ordered, just call me for a quote.